Since there are dozens of insects whose bites or stings cause problems, we will simplify this topic by splitting them into two categories: venomous and non-venomous. The charts below explain the main differences. What's the Difference Between a Bite and a Sting? The differences are due to the nature of the bite or sting. Venomous insects attack as a defense mechanism, injecting painful, toxic venom through their stingers to punish you so youll stay away next time. Non-venomous insects bite and usually inject anti-coagulant saliva in order to feed on your blood. Although local irritation and "allergic" reactions do occur from non-venomous bites, severe reactions such as anaphylactic shock only happen from venom stings. When honey bees sting, they leave the stinger and venom sack attached (see the box on stinger removal in the Treatment section). Venom continues to pump in through the stinger until the sack is empty or the stinger is removed. The only good part about this is that honey bees die after they sting. 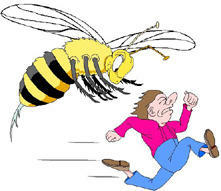 Wasps, hornets, and yellow jackets dont leave their stingers, thus can sting you over and over. Venomous stings are always very painful, red, and swollen up to 12 inches around the sting site. This is called a local reaction. In sensitive individuals, a systemic or "whole body" reaction occurs, with redness, hives (itchy raised skin lumps), and swelling far away from the sting site. These systemic reactions can progress to involve the airways and circulation and may be life- threatening. Obviously its important to know the difference between local and systemic reactions. Biting insects generally arent dangerous because allergic reactions are extremely rare. True, they do spread diseases like Lyme, Rocky Mountain Spotted Fever, encephalitis, and malaria, but for most of us their bites just cause terrible itching. For insect bites and stings, there are two types of prevention: repellents and avoidance. Insect repellents work well for biting, non-venemous insects, but not against angry stinging insects (see the Treatment and Recommended Products sections). The most effective repellent available is DEET (n,n-diethyl-meta-toluamide) available in sprays and lotions. Despite advertising claims, no oral products have ever been shown to be effective insect repellents. Avoidance techniques for bites and stings are summarized in the tables below. Dont wear perfume or scented lotions. Control odors at picnics, garbage areas, etc. Avoid brightly colored clothing outdoors. Destroy or relocate all known hives or nests near your home. Cover as much of your skin as possible with clothing, hats, socks, etc. Pay special attention to cuff areas at ankles, wrists, and neck. Avoid swamps (mosquitoes), dense woods, fields, and brush (ticks, chiggers). Examine exposed skin and scalp areas for clinging ticks after returning from hikes. See Lice and Scabies for prevention tips for these biting insects. See Bedbug Prevention to learn how to prevent these biting bugs. First, the stinger must be removed (see diagram). Pain, swelling, and itching are the main complaints. Home remedies include baking soda or meat tenderizer compresses to "draw out" or destroy protein-based venom. Scientific data is lacking with these techniques, but they do make logical sense. See the table below for medications which can help. Itching is the main symptom to control with insect bites. Topical antihistamines and anesthetics are for quick temporary relief; hydrocortisone cream has slower onset, but longer effect. 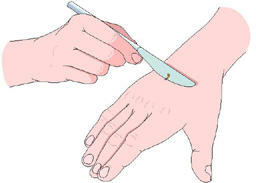 Place the edge of a dull table knife firmly against your skin next to the embedded stinger. Applying constant firm pressure, scrape the knife across your skin surface and the stinger. This removes the stinger without injecting more venom, which is what happens when you remove the stinger with tweezers or your fingers. Motrin IB ibuprofen 200 mg). For pain and swelling from insect stings, Motrin IB is an excellent anti-inflammatory with quick onset. Cortaid 10 (hydrocortisone 1%). This hydrocortisone cream improves both itching and swelling/redness. It actually has anti-inflammatory effects, not just symptomatic relief like the topical anesthetics. However, it does take longer for full effect than topical anesthetics. Dermoplast Spray (benzocaine 20%, menthol .5%). For immediate relief from surface itching and pain, nothing is more effective than the active ingredients in this product. The spray bottle is a convenient method of application, too. Neosporin Ointment (polymyxin B 10,000 IU/g, bacitracin zinc 500 IU/g, neomycin sulfate 5 mg/g). If you're concerned an insect bite or sting may become infected, the active ingredients in this product are the strongest surface antibiotic available without prescription. Any systemic reaction should be seen by a doctor immediately. This includes hives wherever they may occur, swelling in the face, shortness of breath or wheezing, difficulty swallowing, and lightheadedness or fainting. These usually occur within minutes to an hour after the sting. Local reactions generally dont require professional care. However, if your local reaction causes enough swelling or pain to distract you from your normal activities or keep you awake despite basic treatment, you should see a doctor. Many people are worried about infection when they see the redness and swelling from the sting, but that's normal immediately after a sting and up to a few days later. Infection is uncommon and almost never occurs earlier than 24 hours after the sting. After 24 hours, if there is pus or the redness/swelling is worsening, see your doctor.